SIXTH & I STREETS – Somewhere, Reddy Kilowatt is smiling. After more than a year of intense, somewhat mysterious activity at the PG&E substation at Sixth and I streets, the trucks, workers and equipment staged at the parking lot across the street are all gone, as the site’s overhaul has been completed. The project started more than a year ago. Preliminary work at the site was followed by a planned, city-wide power outage in March of 2010 which allowed engineers to switch out equipment and proceed with the overhaul. Since Sept. 11, 2001, those responsible for infrastructure – government and public utility officials – have tended to speak in generalities about critical facilities, and the substation is no exception. Physically, it appears streamlined, with the gleaming, less massive new equipment creating a lower profile on the landscape. 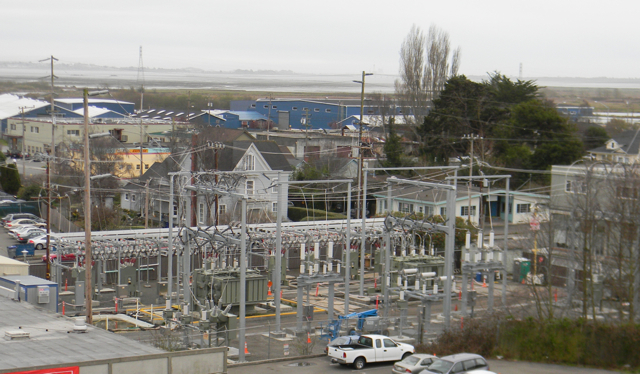 “The recent work at the Arcata Substation was part of a reliability project to replace aged equipment. In the process, the entire substation has been rebuilt. All equipment, including circuit breakers, the transformer bank and the control building have being replaced, in addition to all support structures and foundations and the perimeter fence on the traffic sides of the substation. The old transformer bank was replaced with two new transformer banks. This work was accomplished in just over a year with zero safety incidences. • Arcata Substation serves the city of Arcata, the Fickle Hill area, the Jacoby Creek area and the west side of McKinleyville. • Approximately 11,000 customers are served by the Arcata Substation. This entry was posted on Tuesday, May 10th, 2011 at 7:07 am	and is filed under News. You can follow any responses to this entry through the RSS 2.0 feed.